This video gives a brief presentation on the use and power of presets in Luminar. Basic – used to add clarity, intensify colors, and produce other subtle changes. Street – used to bring out detail, or add contrast; they work particularly well with street scenes. Outdoor – used when outdoor lighting effects need to be changed to improve skies, add detail to dark areas, or add contrast. Portrait – enable you to smooth skin tones and/or add color or warmth to a subject. How it’s possible to transform an image using different presets in Luminar. Travel – often used to evoke a mood. Dramatic – Using these presets can give an image a dramatic flair. A variety of looks are possible, ranging from rich colors and high-contrast tones, to soft focus and desaturated colors. Presets are a great help to beginners, but while a given preset may work wonders for one image, it may not do the same for another. A Preset is just a starting point however; it can easily be modified using Luminar’s selection of filters. Image filters offer a variety of opportunities to create images that can make your design stand out. This filter enables you make selective modifications to an image by working with 2 different (and adjustable) parts of the image to adjust its contrast, exposure, vibrancy, and warmth. This filter is especially suited for adjusting outdoors photos that feature lots of sky. A snapshot of what it’s like to be photo editing in Luminar’s work environment. Contrast controls (sliders) enables you to modify the contrast in two separate parts of an image (top and bottom). The Vibrance slider allows you to increase the strength of less vibrant colors, or lessen the strength of more vibrant colors. The Warmth slider can be used to add warmth to an image, or make it appear cooler. A Shift option is available to move the transition point between adjustments. The default setting is centered top-to-bottom. The Advanced Contrast Filters allows you to fine-tune the tonal content of an image. Six separate slider controls are used to adjust an image’s highlights, mid-tones, and shadows. 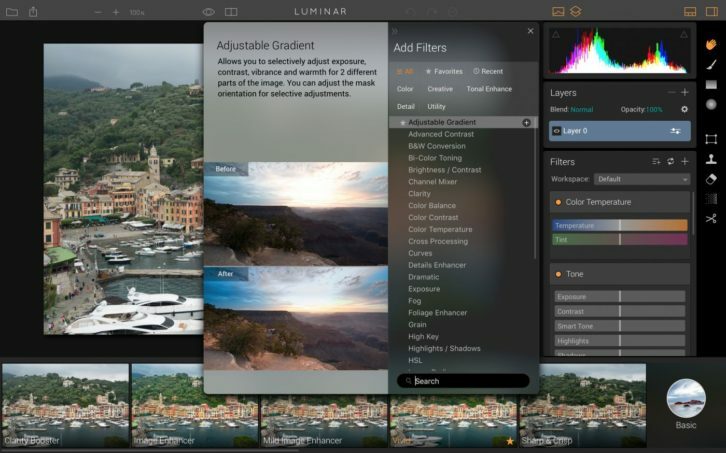 Additional filters Luminar makes available include Black and White Conversion and Bi Color Toning; Color Contrast, Balance, Contrast, and Temperature; Fog and Dehaze; Foliage Enhancer and Golden Hour (for sunrise/sunset), etc. Photo Restoration provides the third photo effect you’ll genuinely love. This popular feature allows you to use vintage photos of seemingly subpar quality in your web design, or for a personal project. Errors/flaws in this old photo have been fixed and masterfully managed. Old photographs can be heartwarming, but they can also be heartbreaking if they’ve become damaged. Sometimes, the damage is beyond repair; but damage due to splotches, creases, and tears can often be minimized, or even eliminated. 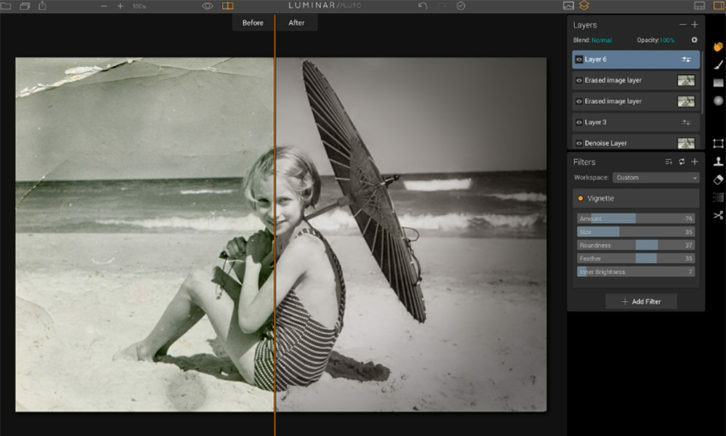 Of the many photo-editing tools Luminar offers, the best one for restoring a damaged photo is the Clone Stamp. The Clone Stamp allows you to copy an undamaged area in a photo and use it to replace a damaged area. You can also use filters, presets, and color characteristics to restore a photo to, or close to, its former glory. Filters can give you the maximum amount of control when restoring a photo, since you can adjust various parameters to achieve precisely what you’re looking for. Presets can provide a quicker way by giving you a good starting point, plus the ability to adjust the photo until you achieve something to your liking. Color adjustments are appropriate when restoration primarily involves adjusting temperature, tint, and other subtleties. Matt Granger, a world-class photographer and educator may have said it best. 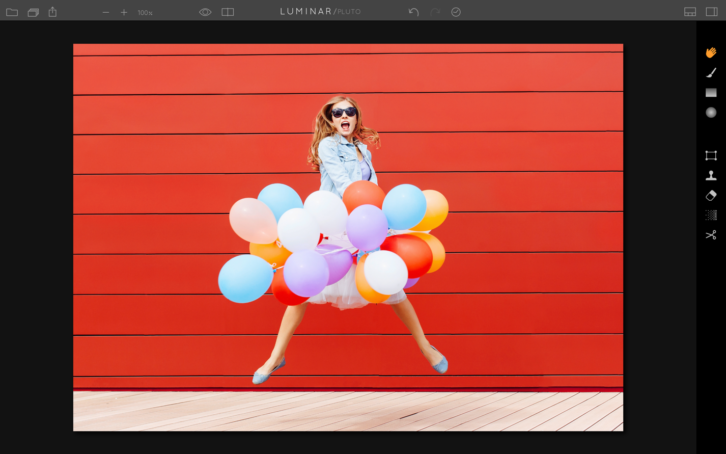 Millions of creative professionals from around the globe; photographers, web designers, and graphic designers, use Luminar as their go-to photo editor.